Saw this over at Moye’s and thought I’d see what you’d come up with. Will you add to it? Joz has a new pair of shoes! Wow. Joz’s life must be extremely dull for her to be blogging about a new pair of shoes! Anyway, I am going to be going on a trip at the end of June where I will be doing a lot of walking. The last time I spent good money on good walking shoes was back in early 2006 for our trip to Italy. Over Memorial Day weekend, when we went to the mall to see The Chronicles of Narnia: Prince Caspian, we also swung by the Walking Store so Yoshi could check out shoes. Yoshi didn’t find anything, but funny how I ended up spending $100 on a new pair of shoes for myself! They’re a little ugly, but they are super-duper comfy! They are casual enough that I can walk in them while sightseeing, but not so casual that I couldn’t wear them for a “dressier” occasion. Sadly, I still won’t get rid of my Munro walking shoes that I bought in 2006 even though I did get a lot of use out of them. Since they’re made of really nice leather, I am convinced that if I get a nice shoe shine they’ll be ok again. Do you want to guess where we’re headed this summer? I love old Fred Astaire movies. Since December of last year, I’ve gone on an out of town trip an average of twice a month. You would think that for a long weekend, I would want to go on a trip, but that would be wrong. I hate traveling during holiday weekends, when everyone else is traveling. I had a lot to catch up with around the house; general chores and stuff. Yoshi is usually the one who cleans and stuff around the house (since I am so horribly bad at it), but I figured that I should pitch in so long as I had some “extra time.” Also, I made a mess of the kitchen, so cleaning some of the more awful messes (especially ones I cause) are really my responsibility. I should have made an appearance at Darleene’s birthday party on Saturday, but I since I am almost always using the excuse that “I’m never home” so I don’t have to clean, I figured leaving for a party on cleaning day wasn’t a good idea. By the end of the evening, I was tired of being home all day, and I whined my way into having Yoshi go to the movies with me. We ended up stopping by the drugstore to buy a stash of candy, grabbing a quick bite of pizza, and then watching “The Chronicles of Narnia: Prince Caspian” at the Century City AMC*. Boy, that is a long movie! It’s a good thing I looked at the running time (2 hours, 20 minutes!) before the movie started. I decided not to drink anything until the movie was almost over so I wouldn’t have to run from the film doing the pee-pee dance. On Sunday, I made a quick visit to see Grandma and to run a quick errand near her place before driving back to OC to spend time with my Mom. Mom had been at a friend’s funeral service in the morning and decided to get gas and groceries on the way home. I had intended to extend my cleaning streak to help my Mom around her house, but instead, she asked me for help in making potstickers. 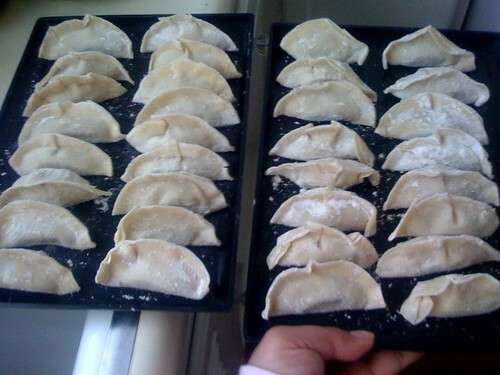 From hand chopping the nappa cabbage to folding the potstickers, my Mom let me sit on the living room floor in front of the TV (as I did when I was growing up) and fold a couple of hundred potstickers. (I watched the movie “Clueless” on TBS and then kept flipping back to CNN as they were doing live coverage of the Phoenix Mars lander.) My Mom was taking potstickers as fast as I was making them, and throwing them on to the stove as she was pan-frying them. Yum! I brought a couple of batches home, foolishly thinking that I’d freeze them and save them for another day but I ended up pan-frying them myself so Yoshi and I could pig out on almost all of them for dinner on Monday night. Yum! Gyoza! After dinner on Sunday, I took my Mom to The Block in Orange to run a quick errand and do a quick walk-through of half the mall. We stopped into Bath & Body Works and tried a bunch of fragrant lotions and stuff. My Mom had the most fun trying on the flavored lip glosses. I tried pink grapefruit. She had fruit punch, which made her lips a bright pink. With glitter. Hilarious and so much fun. “Mom, there are no movies starting at 11pm on a Sunday night,” I reminded her. “I don’t have to see the whole movie, let’s go see something that’s already started!” she answered! Oh yay! I was going to be theater-hopping at midnight with Mom! She headed to “Harold & Kumar,” but not wanting to have to explain any potentially gross humor to my mom, I steered her to the Narnia movie I had already seen the previous night, especially since I knew there was at least an hour of that movie left to go. We walked into as a massive fight scene was happening and since there was no context of what what happening my Mom was confused. “WHAT is going on here with all these animals fighting?” she asked. I had to explain that the animals were the good guys and the mean looking people were the bad guys. After that, it was all good. Of course, by the time the movie was over, it was 12:30… way past my bedtime! Instead of going back to L.A., I spent the night in OC at my Mom’s house. When I woke up on Monday morning, I was trying to leave early, but I had accidentally popped the trunk of the car the night before and the car battery died from the little trunk light being on all night. Ooops. Luckily, no one stole any of the Cup-O-Noodles out of the back of my car while it was open all night on the street in front of my parents’ home. Anyway, I had to go get gas, so while I was out, I stopped by the movie theater and picked up a pair of tickets for my Mom to catch a matinee of the new Indiana Jones movie. I wanted to stay, but wanted to hit the road before the mad long weekend traffic kicked in. I made it home in 35 minutes flat. Nice! *Through my old job, I have an Annual Pass for movies at AMC Theaters, good for me + 1 through the end of this year. Sadly, the pass I had for 2007 was practically wasted on me because I didn’t have time for movies while I was in school last year. I have resolved to make VERY good use of my pass this year now that I’m done with school and while I still have a pass. I most definitely won’t be getting a pass next year. **As always, italics means it was in Mandarin. Yoshi and I were going to meet up with the Prof, his beau, and another old friend for some vegetarian soul food at lunch on Friday, but I got a call at the last minute that lunch was canceled. “What’s going on?” I asked the Prof.
“Oh no. Can I drive you to the airport?” I asked. And thus our lunch plans changed to driving the boys to LAX over my lunch break. On Saturday night, I got an email from the BF that his Dad had passed away at around 8:15pm Illinois time. They have been on my mind all weekend and we have been sending our love from L.A. We love you guys. Make Facebook useful AGAIN? When was it useful in the first place?! Last night my boyfriend and I had free tickets to see Iron Man. I was kind of excited to see it since I had heard great reviews, and had friends involved with the CG so I wanted to see their work. It was also wicked hot and we needed some AC. I had high-hopes that it might be politically less offensive then most other blockbuster Hollywood movies since I hadnâ€™t really heard any criticism about the portrayals of minorities etc. Please note: this is a quick response to the film so sorry for the typos and bad grammar. I don’t know about you, but when I look at the news, I tend to skim through it online and maybe read a story or two that catches my eye. But when you hear about something first AND THEN start looking for more information, well, that’s a whole different way of looking at the news. Last year, with the Virginia Tech massacre still in progress, I had arrived at work (not having seen or heard any news yet) and saw the IM status message of my brother’s girlfriend (then a student living on-campus at VT): “Campus shooting. Under lockdown.” I spent the rest of the day online chatting with her and keeping tabs on all the news as it developed. Last night around 3am, there was a wrong-way driver in a Toyota Yaris driving northbound up to 80mph on the southbound 5 near Commerce. 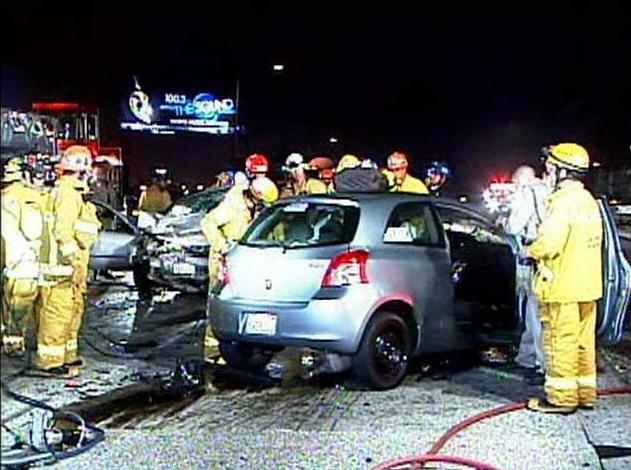 He collided with a Nissan Sentra filled with the friends of B; the female driver and a female passenger in the car were killed, along with the wrong-way driver. 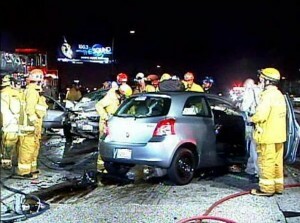 Two male passengers in the Nissan Sentra are critically injured. There was another friend (D), who was driving in another vehicle who witnessed the collision and said that both cars went airborne after they crashed. D called B at 6am to tell her what had happened. And although the group had been at a club in Hollywood, they had not had any alcohol. They were simply driving the right way on the freeway, trying to get home after a fun night out. There is some coverage in the local news, at CBS and NBC (video and slideshow available), but this is the type of story I normally would have glanced at and not given another thought to. Today, I am looking at the story with my friend and B in mind, and I send my deepest condolences to everyone who has been impacted by the losses of these young lives. An old article at Fridae about Howard and Efren’s marriage back on Valentine’s Day of 2004. The jozjozjoz.com archives for May, 2008.